I met him in an airport last June. He was reading new poems by W.S. Merwin. In hardcover. A rare species! He’d been Lou Reed’s keyboard player, among other things, and said good poems helped him write songs. We talked until they called his flight, and the conversation left me giddy in the way travel should, but mostly doesn’t, now that we move about with our wires drooping. We stayed in touch. I read an article about him, learned he’d survived leukemia after a bone marrow transplant. In December he released a new solo album, which I downloaded and burned to a CD. It’s been kicking around the house for a while. I keep meaning to take it out to the car, listen to the whole thing on longer drives. Yesterday he posted that all his dates are cancelled for the foreseeable future. He’s in his 40s. The title track’s an earworm. When leukemia killed my daughter’s friend at sixteen, I wasn’t much help, called it unfair and she agreed, cried into my neck. He was beautiful, and open as the day. How to Avoid Huge Ships is Bruck’s fourth full-length title, after The Woman Downstairs (1993), The End of Travel (1999) and the Governor General’s Award-winning Monkey Ranch (2012), all of which have been produced by Brick Books. These are poems that evoke both loss and grief while allowing for a kind of zen appreciation of her subjects, writing out grief even as her narrator(s) learn to allow that same grief to pass through the body. Moments, as John Newlove wrote, not monuments. In lieu of faith, there were books. young woman reading on her stoop. How to Avoid Huge Ships instead. vessels, he remarks, are slow to turn. They can be very difficult to stop. 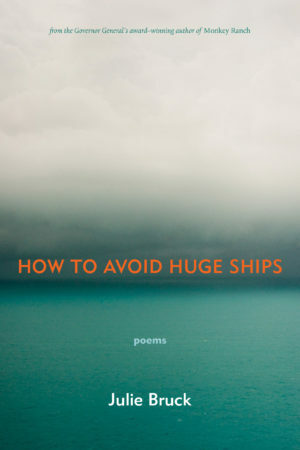 This has nothing to do with Ms Bruck's poetry, which I liked -- but some time ago, I stumbled across another "How To Avoid Huge Ships", this one published in 1994 by Cornell Maritime Press (ISBN 10: 0870334336 ISBN 13: 9780870334337), written by a Captain John W. Trimmer, covering in . The idea of a book about avoiding huge ships seemed... well, weird. I mean, they're huge; you avoid them. Apparently, it's not that simple, which means other assumptions about daily life may also be incorrect.